I had to keep this a secret for fear that people might look at me strangely, but my dearest ambition before going to Japan was to give a cow a massage. In the end, I did better than that, I even got to spit shochu over one, more importantly I got to the bottom of the various myths about bizarre Japanese cow husbandry techniques and how they result in such super-tender meat. 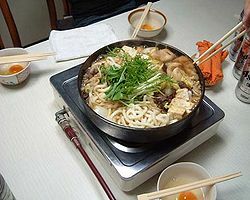 My favourite way of preparing it is as sukiyaki. Eating cold noodles may, for many, conjure disturbing flashbacks to cold pasta buffets, but in Tokyo, Zaru Soba (cold buckwheat noodles served with a dashi-based dipping sauce), is considered the height of refinement. It’s easy to make at home, but ideally you’ll have a zaru (drainage basket) to serve the noodles on. Tofu deserves a major PR overhaul in the West. In Japan, where it used to be delivered fresh, daily, like milk, they are used to eating theirs soon after it is made and adore its clean, light mineral flavour and creamy texture (one of the things I love most about Japanese cuisine is its incredibly broad texture palette). The best I ever tasted was in the temple quarter of Kyoto, where the icy, clean mountain water helps create the finest tofu in Japan. Chances are you don’t live in Kyoto, but worry not. Serving it as agedashi, or deep fried tofu, conceals a multitude of inferior tofu sins, and it makes a brilliant show-offy starter with its crisp, hot exterior and creamy, cool interior - especially if you can muster the all important garnishes. It was the infamous French restaurant critic, Francois Simon, who told me Osaka was the most exciting food city on earth. He was right, particularly as far as its fast food is concerned. Tako yaki (octopus doughnuts - no, really, they are delicious); okonomiyaki (a thick pancake, typically with pork or seafood in the mix); and kushikatsu (related to yakitori, but breaded), were all invented there, along with kaiten sushi and instant noodles. Osakans are famed for their impatience and gluttony. Best of all are the thick, brown, meaty-sweet sauces that accompany all three of them. Each chef will have his own, often highly elaborate secret recipe, simply topping them up at the end of the week with new ingredients -some are, thus, decades old. While in Tokyo we were lucky enough to be allowed into a small Sumo stable, or heya, in Ikegami. I had ambitions to sumo-size myself and took a sneak peek into their fridge. Disappointingly, it was full of healthy fresh vegetables, tofu and chicken. As we discovered when we were invited to lunch, sumos are quite the gourmets. While visiting Okinawa to research the fascinating secrets of their traditional diet - part of the reason why Okinawans live longer than anyone else in the world - we discovered the delicately floral-flavoured Okinawan sweet potato ice-cream, famous throughout Japan. It is made from the equally celebrated Okinawan sweet potato, a deep purple-coloured tuber believed to have miraculous nourishment properties. Ordinary sweet potatoes work almost as well, although you won’t get quite the same pale lavender colour. Western chefs discovered the meaty, nutty - admittedly also slightly farty - flavours of miso paste years ago, but still home cooks seem reluctant to introduce this salty, fermented soy bean paste (which can also include barley and rice) into their cooking. When I was in Osaka I met an English miso maker, Tony Flenley, who tipped me off about all manner of uses for miso in home cooking - it adds a potent umami boost to stews and sauces, for instance. A classic is to sweeten miso paste to use as a dengaku, a topping for grilled vegetables, tofu, or best of all, aubergine. Of course, we didn’t abstain entirely from sushi while in Japan. How could we? Raw Matsusaka beef nigiri and whale and horse sashimi were unexpected highlights, as was an afternoon I spent learning tips and tricks at the feet of a master sushi chef in Ebisu, Tokyo, incuding keep the rice at its body temperature so that it contrasts with the chilled seafood; don’t mix your wasabi into your dipping sauce - it’s common - and steer clear of the spicy tuna rolls. Why do you suppose they are using those spices? The Japanese are infatuated with pickles, or ‘tsukemono’. No meal is complete without their welcome vinegary crunch. Indeed, the Japanese equivalent of meat and two veg is miso soup, rice and pickles, and every town or shopping area will have at least one pickle shop with barrels of funky smelling vegetables steeped most often in rice bran, but also sake lees (the by-product from making sake), miso and brine, out front. Kyoto’s astonishing Nishikoji market is the spiritual home of Japanese pickles and there I tasted a simple but highly addictive cucumber pickle. For me the king of all seafoods are the gonads scooped from within a still-living sea urchin, or ‘uni’. Challenging for some, I know, but they do really need to be alive because uni go off rapidly, taking on an unpleasantly chemical, ‘toilet cleaner’ flavour. At their best, meanwhile, they taste how I imagine vanilla ice cream might taste if it were made by mermaids. My family and I were lucky enough to enjoy a grilled lunch with the fabled female free divers, or ‘ama’, of Mie prefecture. They told me their favourite thing to do with uni.